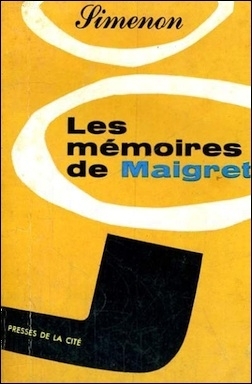 The world's most prolific author, the Belgian writer Georges Simenon, published a mock-memoir in 1951, Les Mémoires de Maigret (Paris: Les Presses de la Cité; English: Maigret's Memoirs, London: Heinemann, 1978), which featured the ostensible recollections of his fictional character, Inspector Maigret. The sixth chapter, titled in the English translation "One Staircase after Another!" (and brought to my attention by C. Paul Barreira) describes the pro-fascist uprising in Paris on Feb. 6, 1934. It reminds one eerily of today's North African immigration and Islamist alienation. 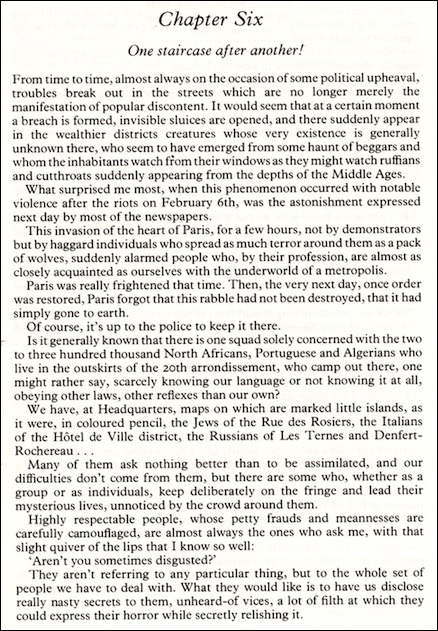 Simenon begins by noting that during political upheavals, human elements commonly appear in wealthier districts of Paris "whose very existence is generally unknown there, who seem to have emerged from some haunt of beggars and whom the inhabitants watch from their windows as they might watch ruffians and cutthroats suddenly appearing from the depths of the Middle Ages." These elements proceed to "spread as much terror around them as a pack of wolves." solely concerned with the two to three hundred thousand North Africans, Portuguese and Algerians who live in the outskirts of the 20th arrondissement, who camp out there, one might rather say, scarcely knowing our language or not knowing it at all, obeying other laws, other reflexes than our own? And while many of these immigrants wish to be assimilated, "there are some who, whether as a group or as individuals, keep deliberately on the fringe and lead their mysterious lives, unnoticed by the crowd around them."